These Habbo's have completed the Habbo talent track and reached "TBD" These people will assist and Help Ambassador's with there Duties. This group in no way gain's you Ambassador. Are you tired of being harassed by Habtaz? We, as individuals, are expressing that we believe Habtaz is abusing his powers as an Ambassador and should be removed. Ban on sight Habtaz from your rooms to support the movement and lobby your friends. Can be bought from directors for 50c! Grants access to [AIM] base. A badge for all the people i trust the most and class as my good friends, and i will always respect and help if needed. The legacy,the loyalty, get drunk a lot and have fun,for those who i trust the most. The people on this badge are granted access into HDA base. SV costs 100c for all non allied members. This badge is Free to all 4iC+ and EA allied members. This badge can be given for free to friends of Foundation members! 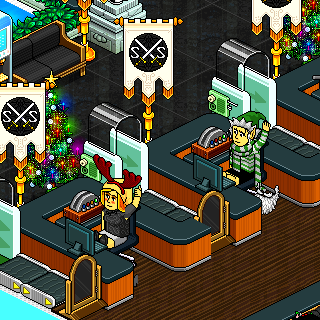 We are a group of experienced Habbo's that are dedicated and determined to ensure the safety of the hotel and it's users. We are GUARDIANS. If you are part of this group, I can trust you and are a great friend of mine. Everyone in this group are awesome people so respect them! the holder of this badge Represent the must op beard, only if you are ready to use is all the time. beth beard is our cult. Like swemming? Well don't hold back as it's only £50, but 3% off new year special sale! NOTE: This is NOT an official SS badge! 50c - Being a special visitor allows you to come inside Black Ops Headquarters. ALLIANCE: 3iC+ Can obtain this badge for free! This badge provides access to the General Meetings hosted by Human Resources weekly. SHS is now closed but the design can now be found in agavesyrups Belmont High School. Present in the badge are the many who are granted access into the (Federal Security). These Special Visitors hold a higher standard in the Head Quarters and are entitled to respect by all members. To all my friend you can freely join here in my badge. I love you all | You can visit my room if you want Just click Go to Homeroom in this badge. And dont forget to rate it. The Campaign that got Luukes elected as 20th President of the Habbo White House, and got Mikhuuh elected as 43rd Vice President of the Habbo White House. Thank you for your support! El universo que se vuelve tan pequeño.. These are great people they are close friends and have helped me through my SS journey. Friendship can be found anywhere. Real friends will not leave you over small matters. They sit down and work it out no matter how tough of a nut you are to bobba. These people paid for VIP! Only for certain amount of days though. Who does that? Taken in this room on 6 June 2018 and received 1 likes. Taken in this room on 23 November 2017 and received 0 likes.